In a typical house air leakage accounts for 20-40 percent of heating and cooling costs. Most homes have the equivalent of a perpetually open window in combined air leaks! Such big losses offer the best opportunity for big savings. Of all the methods to reduce energy use in a house, air leakage control is one of the most cost effective. According to the Department of Energy, proper air sealing combined with effective insulation can reduce your home’s heating and cooling costs by as much as 50 percent. Once your home is airtight and free of cracks or leaks your heating and cooling systems don’t have to work as hard and therefore are more efficient. Your home will be more comfortable and your heating and cooling costs will be lower. Perhaps as equally important as insulation, air sealing is crucial for maximizing the performance of insulation, the other major component of your home’s building envelope. 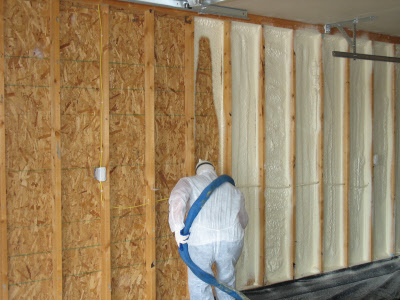 The R-Value of insulation is determined under the assumption that there will be no air infiltration throughout the insulation — it assumes that there will be adequate air sealing around the insulation. Once insulation is left exposed to air movement (air moving up through your attic floor, for example), R-Value decreases. Air sealing often yield the greatest return on your investment in terms of energy savings. Although some of the air leaks in your home are easy to find — around old and untreated doors and windows, for example — much of the average home’s air leakage takes place in areas you don’t see. A lot of it takes place because of something called the stack effect, or chimney effect, which works like this: Like wind, the stack effect can move large volumes of air through a building envelope. In the winter, the warm air in a heated building is lighter (less dense) than the cold air outside the building; that warm bubble of air wants to rise up and out. It works its way up through the floors and walls, then up into your attic through structural defects, holes in your ceiling, recessed lighting, leaky duct work, the furnace flue, plumbing stack, poorly sealed attic floors and other areas. As heat escapes through the roof, cold air is sucked in through the basement around the rim joist area and through first floor windows and doors. Though the pressure created by the stack effect is 3 times stronger in the winter, the reverse happens in summer when hot air outside of an air-conditioned house can push cooler indoor air down from the ceiling and out of cracks in the basement, this can lead to moisture problems on the top floor. The stack effect occurs every hour of every day, and the pressures generated by the stack effect are significant. Leaky buildings consume tremendous amounts of energy. Air leaks also contribute to condensation and compromise the quality of the indoor air. The result is your heating and air conditioning systems have to work harder, use more energy and cost more to operate to keep your home comfortable, not to mention the indoor air quality issues due to pollutants being sucked into your home. 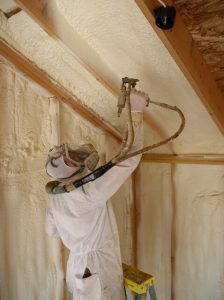 A home performance contractor doing air sealing work in your home will generally focus on the basement and the attic floor in order to minimize the stack effect, and thus minimize unwanted air movement throughout your home. A home energy evaluation performed on your home will help to reveal the problem areas. This includes blower door testing and thermal imaging to identify and locate hidden leaks and gaps. Clear Choice Energy Solutions technicians find and seal the cracks, crevices, and holes in the interior and exterior of your home. We also check to make sure combustion appliances (gas- or oil-fired furnace, water heater) are venting properly. The EPA and Energy Star recommend this on every similar project. home’s leaks for free, and provide a practical and affordable plan to seal them against the cold and wind. Contact us today, and Clear Choice Energy Solutions insulation experts can assess your home’s leaks for free, and provide a practical and affordable plan to seal them against the cold and wind.